Those of you that have known my writing over the years have known that when I do soccer blogging of major events, I do a rundown of the teams that will be competing. Some of you may have guessed I’d be doing it again for the World Cup, and you are right. However I’m doing a separate blog for each of the eight Group Stage groups. So much to preview, so little space. With this being my first blog of the upcoming World Cup, then it’s no question the first blog will be done on Group A. For the record, my summary of the teams will be done in their drawn World Cup order rather than their FIFA ranking of May 2014. FIFA ranking of that month will appear in brackets. -Brazil (4)-No other country has as much of a football legacy as Brazil. Brazil is the only country that can boast competing at all nineteen past World Cups and the only country to have won the World Cup five. The World Cup arena has been an excellent showcase of Brazilian football at its best and it has inspired the world around. However we’ve also seen Brazil choke at times, especially in recent competitions. Just ask France. They’re known as Brazil’s ‘achilles heel’ and have handed Brazil some surprising defeats including the 1998 world Cup final and the 2006 World Cup quarterfinal. In both cases, Brazil was the defending World Cup holder. Brazil’s recent chokes were more humbling as they choked to the Netherlands in the 2010 World Cup quarterfinal and at the 2011 Copa America, they lost their quarterfinal in what was Brazil’s worst-ever Copa America performance. Brazil can’t take any chances at this World Cup more than any World Cup. They’re the host country and all the world expects them to win. They especially want to rid their compatriots of the 1950 ‘Maracanazo,’ which I will talk about in another blog. Yes, Brazil may have won the World Cup more than any other country but of the eight countries that have won the World Cup, Brazil and Spain are the only ones to fail to do so as host country. Brazil hopes to end this ignominy this time around. After their Copa America debacle, they sacked their coach in favor of Luiz Felipe Scolari who helped coach Brazil to its last World Cup in 2002. The return to Scolari has paid off as Brazil won last year’s Confederation Cup defeating reigning World Cup holders Spain 3-0. Since the return of Scolari, Brazil’s overall record has been excellent losing only twice: to England and Switzerland. No doubt they’ll face huge pressure but the Confederations Cup proved that Brazil is back in action and ready to deliver. -Croatia (20)- If you were to do a pound-for-pound rational of football teams, Croatia should rank amongst the top. Croatia is one of only two countries in FIFA’s current Top 20 with a population of less than 5 million . Uruguay being the only other country. Ever since their independence in 1991, Croatia has proved itself a formidable force in football, especially at the 1998 World Cup where they finished third. However that was the last World Cup where they even advanced past the Group Stage. 2002 and 2006 appearances didn’t pan out and a failure to qualify in 2010 almost made the Vatreni’s glory a thing of the past. However Croatia is looking to mount a comeback. In 2012, they signed on a new president in Davor Suker, himself a former great as the top goalscorer at the 1998 World Cup. The role of manager was replaced by former team captain Niko Kovac. The team successfully qualified for the World Cup. They also have a good mix of talent from veterans like Darijo Srna and Luka Modric and fresh young talents like Dejan Lovren and Mateo Kovacic. Croatia is one country that’s very capable of causing a surprise. -Mexico (19)- Mexico is without a doubt the best team in the CONCACAF as far as legacy goes. No other North American team has qualified for the World Cup as often. However its greatness has appeared to have alluded them in the past couple of years. They failed to advance past the Group Stage of last year’s Confederations Cup, they lost to Panama in the semifinals of the CONCACAF Gold Cup and almost missed qualifying for the World Cup in a qualifier against Costa Rica where they trailed 1-0 after 80 minutes. Two goals in the last 10 minutes kept them alive where they’d go on to beat New Zealand for the wildcard berth. Mexico has made efforts to make their near-loss to Costa Rica a thing of the past. They have not lost a game since but they have come across some tight ties like a scoreless draw against Nigeria and even a 2-2 tie against the US last month. Mexico hopes to be ready for Brazil. Miguel Herrera is one tough coach who favors home grown talent over talent from European leagues. That could be the factor that could either spell success or failure. Only the World Cup stage will decide that. -Cameroon (50)- Older people may remember Cameroon as the team that came from nowhere in 1990 to win 1-0 against defending champions Argentina. Cameroon charmed the world that year by reaching the quarterfinals and becoming the first African team to do so. However their glory appears to be a thing of the past. Cameroon has not advanced past the Group Stage since. This time around doesn’t show too much promise. They do have a German coach, Volker Finke, and have good talent in Samuel Eto’o and Alex Song but they do face a heavy battle in group play. Already this year, they’ve had mixed results with a 5-1 loss to Portugal and a 2-0 win against Macedonia. Nevertheless it’s too soon to judge. I’ve seen teams where nothing was expected of them and they’d advance far. This is a new feature. This is where I get to focus on the various stadia that are hosting the World Cup. I figure the arenas are worth talking about. Brazil has twelve stadia that will facilitate for the World Cup: seven just opened within the past year. The crazy thing is how the Group Stage play is organized. Usually in most cases at a World Cup, the country would have organized certain Group Stage groups playing at a set stage of stadiums. In Brazil’s case, a country with twelve stadiums may have three stadiums in cities close to each other to host the Group Stage games of two groups. Division that simple. Brazil has done it weird. All twelve of the stadiums will hold four Group Stage matches but they will be matches for four different groups. Additionally, all six of the Group Stage games for each individual group will be played in six different stadiums, and not all will be that close by. That will mean a lot of traveling around for the 32 teams, especially in a country of over 3 million square miles. One of seven new stadiums built especially for this World Cup, the most unique thing of the stadium is definitely the roof. While Brazil had made headlines with difficulties of building and completing stadiums in time for the World Cup, this stadium however earned praises from FIFA not just for the stadium itself but for development of areas surrounding the stadium which I will talk about later. This stadium finished in good time and officially opened this January. 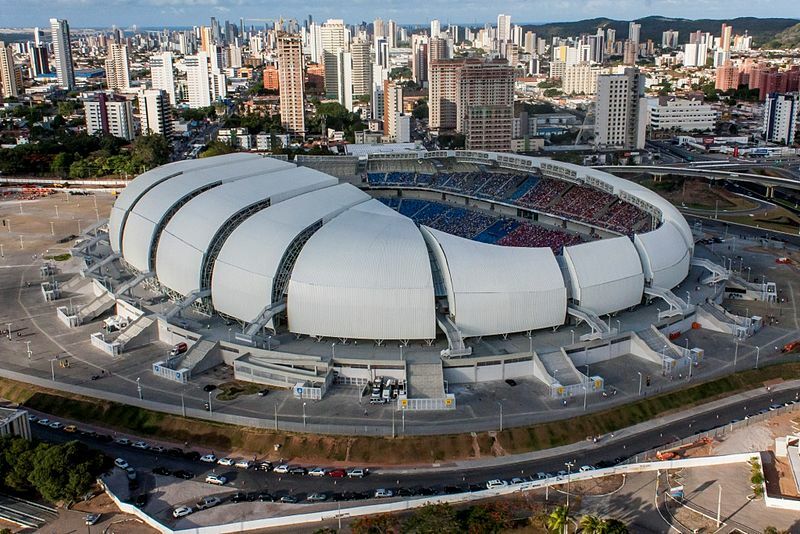 After the World Cup, the stadium capacity is to be extended to 45,000 seats and to be the stage of home games for both the America Futebol Clube and ABC Futebol Clube. The area surrounding the stadium has planned a shopping centre, commercial buildings, hotels of international standard and an artificial lake. There was some criticism from England’s manager Roy Hodgson about Manaus hosting World Cup matches. He should watch his tongue as England will be playing the very first World Cup match of his group there, against Italy. This was one new stadium that actually was under question whether it would be ready for the World Cup. The stadium has been completed and was officially opened in March. The stadium has a full capacity of 46,000 and is to be the host stadium of Nacional FC after the World Cup, replacing the now-demolished Vivaldao Stadium. And there you go. My first preview of the World Cup teams and stadiums. As for predictions, I’ll just settle for predicting the two countries that will advance past the Group Stage right now, and I predict it will be Brazil and Croatia. Seven more groups and ten more stadiums to review before World Cup 2014 starts. Stay tuned for more.